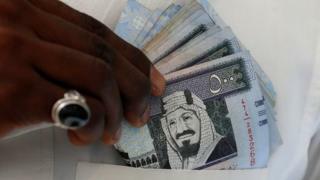 Saudi Arabia has unveiled pay cuts for government employees for the first time, as it attempts to further rein in spending at a time of low oil prices. A royal decree said ministers' salaries would be reduced by 20%, and housing and car allowances for members of the advisory Shura Council cut by 15%. Lower-ranking civil servants will see wage increases suspended, and overtime payments and annual leave capped. About two-thirds of working Saudis are employed in the public sector. Their salaries and allowances accounted for 45% of government spending in 2015, or $128bn (£99bn), and contributed to a record budget deficit of $98bn. BBC Middle East analyst Sebastian Usher says the unspoken contract that once existed between ordinary Saudis and the ruling elite - in which citizens could all but expect a none-too-stressful job for life in return for accepting the status quo - has long been eroding. But, our correspondent adds, the deficit highlighted the urgent need for change. In April, Crown Prince Mohammed bin Salman unveiled a reform plan intended to reduce the government's spending and lessen its dependence on oil revenue. The "Vision 2030" initiative aims to cut the public sector payroll to 40% of the budget by the start of the next decade and boost private sector employment. The government also cut the generous subsidies for petrol and utilities in December, but complaints prompted Prince Mohammed to sack the water and electricity minister six months later. Some Saudis took to social media to express their support the cuts announced on Monday, using the Twitter hashtag "We are the children of King Salman". But others lamented what they remembered as better days under the late King Abdullah, who responded to the Arab Spring in 2011 by launching a $130bn plan to raise public sector salaries, build subsidised housing and provide benefits to the unemployed. The hashtag "stop allowances for princes" also trended among Saudi Twitter users. "If there is hardship, we should all share the cost," wrote @oamaz7. Jamal Khashoggi, editor of Al-Arab News, told Reuters news agency: "It's one more economic measure to balance spending. Of course people don't like it, but it's a sign of the times." "Probably the teachers and many others will be affected by it. It shows why it's important for the private sector and Saudi GDP to diversify," he added. Saudi Arabia: Can the country adapt to cheap oil?